When it comes to the best jewellery, only one statement holds true- a bride can own as many as she wants! Yes, jewellery is the ultimate form of luxury shopping for the Indian bride. 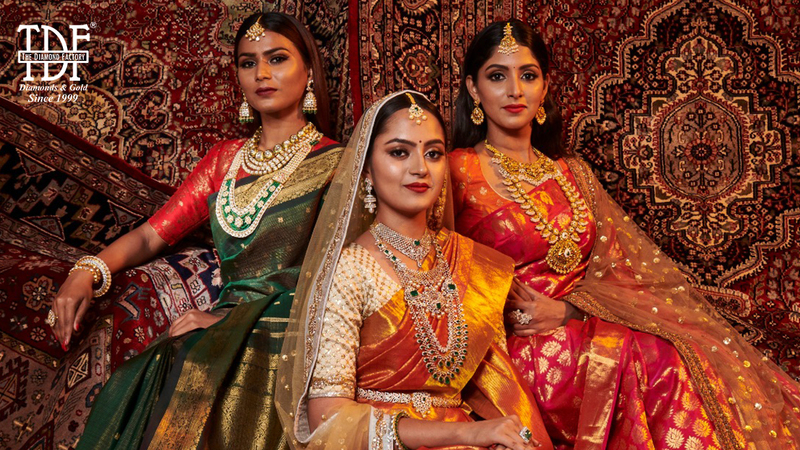 From the traditional stuff to the world-famous brands, from contemporary, stylish ornaments to antique South Indian Temple Jewellery; each item is worthy of being proud about. Nothing brings more glow on the face of a bride than a statement Maang Tikka. Why is it a favorite thing amongst the brides? It is because the tikka draws attention to itself and the bride. Sits gracefully by encircling the crown, it adds glory to the face. Whether you wear it on the wedding day or reception, the magic and mesmerism of a tikka are endless. Mixed metal with gold plating, stone and pearls make it stunning. Enrich your collection by picking some incredibly beautiful maang tikka from Bridal Jewellery Shops in Mumbai. It is a perfect complement to an individualistic personality. Add the instant charm to your appearance wearing the multi-layered necklace from the best jewellery house. It is a must-have for every bride. Interestingly, this charming jewellery is feminine and trendy. It makes the dress more gorgeous. You can wear a necklace on every occasion. The attire of an Indian bride is incomplete without the necklace set. Nowadays, the extra-long necklace is in high demand. The creative designers use their experience in churning out incredibly beautiful pieces to grace the occasion. Grab an exclusive, breathtakingly beautiful necklace of superior quality and meet the style needs of yours. Earrings and jhumkas are an essential part of the jewellery collection of every bride. The perfect pair of earrings enhance appearance. For weddings and other special occasions, the oversized earrings or jhumkas are in. A stunning pair makes you star of the show by adding style. From silver to platinum, and pearls, precious stones or diamonds, brass earrings or kundan; the variety is mind-boggling. Jewellery is essential, but some ornaments are absolute must. A choker is one such item. Be it a formal attire or casual; they go well with everything. If you are a bride who wants something unique and eye-catching, then opt for a choker. The exhaustive range of chokers is sure to delight. Don’t worry about the fading of polish or shine. When you buy certified jewellery, it is guaranteed that the charm will be everlasting. What picture flashes in your mind when you think about an engagement ring? Yes, it is a stunning solitaire diamond. This timeless classic defines beauty and elegance. It has been ruling the fashion world from ages. When you are the star of the occasion, you need something that matches your glory. Indeed, nothing can beat a solitaire ring in this aspect. A Diamond engagement ring is forever precious. Therefore, when you show it off, everyone is in awe of you. Hence, when you choose the perfect solitaire; it captures the attention of everyone. It is not possible to have a piece of exclusive jewellery for every function. It is quite expensive. However, you can have a collection of multipurpose jewellery that can just perfect fit for any occasion. They have the potential of enhancing your personality day in and day out. Whether it is a small party or anniversary celebration, a get-together or farewell; you can show the uniqueness of your choice by wearing attractive multi-purpose jewellery. The collection of nose pins, pendants, and earrings, necklaces and bangles receives all the focus. Buy the bestsellers and get an accolade from others. Mangalsutra is not just an ornament, but it has deep-rooted meaning associated with it. It is the symbol of marriage. It is a ‘most favourite string’ for a bride. The black beads and beautifully carved gold pendant have immense significance in Hindu tradition. It is an image of modesty and conjugal modesty. It portrays the association of spouse and the wife. Whether artificial or gold, it is an integral part of a wedding collection of every Indian bride. Are you searching for a gorgeous ornament to the extensive collection of exotic jewellery? If yes, then Nath or nose ring is worth to consider. In some places, it is considered as auspicious as the Mangalsutra for a married woman. Whether you want to make it the part of everyday wardrobe or something that is to be considered for special occasions, it is perfect for every woman. It is not just decorative stuff, but a symbol of the eternal married relationship in the Hindu tradition. The tradition of bangles is thousands of years old in India. It is the most adored piece of jewellery for every Indian bride. The circle represents the constant love and bond between the couple. It also symbolizes the cycle of life which doesn’t have any beginning or end. From simple to intricate, gold to platinum, and daily wear to occasional; you get the virtually unlimited list of choices. Pick some classic, contemporary and traditional pieces to make it complete. Pick them from the best shop and get outstanding items for your collection. Remember, the quest for the best jewellery is unending. You need to be vigilant and watchful to choose the most adorable stuff.